Vincent and Immanuel are an inspiring team. Chennai: S. Vincent is on cloud nine. The glowing dwarf on Friday received not only his B.A. degree in History but also a special medal for top scores in the academics as well as extra-curricular campus activities at the 91st graduation ceremony of the prestigious Loyola College here. "I am extremely happy, thrilled in fact. It's not just the fruits of my hard work that got rewarded but also the selfless love and care that my teachers, my guardian and my roommate bestowed upon me. I am eternally grateful to them all", said the 25-year-old youth who had been brought up in an orphanage from childhood. Vincent is particularly fond of his roommate Immanuel, who had been carrying him around wherever he needed to go these past three years - for academic as well as the extra-curricular activities - without complaining and expecting anything in return. While Vincent is a native of Kallakurichi, Immanuel is from Manapad village in Thoothukudi district. Both friends have been looked after in the orphanage run by L Somasundaram, a kind philanthropist who has been the foster father for over 40 such orphans in the city. "Vincent and Immanuel are an inspiring team. Their friendship is unbelievably strong and undemanding. 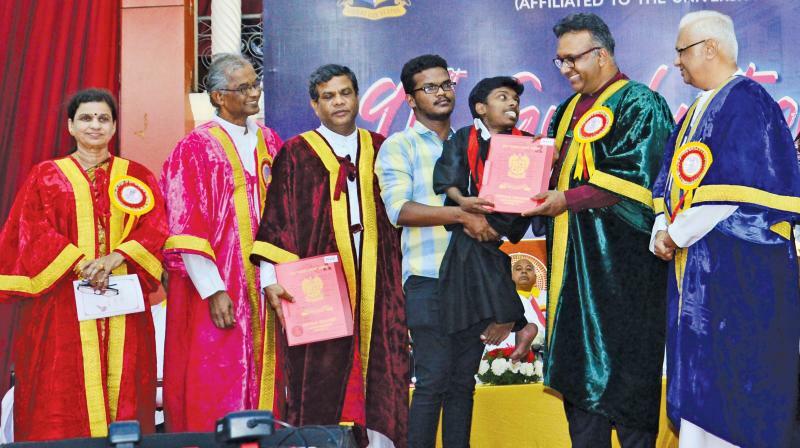 And despite their heavy odds, such as poverty and the physical disability in the case of Vincent, the two boys with rural Tamil education have been consistently scoring high in their academics at college here", said Somasundaram, while heaping high praise upon Loyola for "taking such kind care of the poor boys". Immanuel is now doing his second year Masters in Commerce at Loyola while Vincent is in the first year M.A (History). "I will do M.Phil and B.Ed. I will be a teacher", said Vincent with awesome confidence. As for Immanuel, he wants to do C.A., but is worried about funds. "I have been a good student throughout and I am confident I can clear C.A., but I need financial support for this", says the young man. Should any kind soul want to respond to that stretching hand, his phone number is 7904773713.